As the party leader continues their cross-country tour, a new national survey by Ottawa-based Abacus Data finds that, except for Jack Layton, the main party leaders are viewed unfavourably by Canadians. 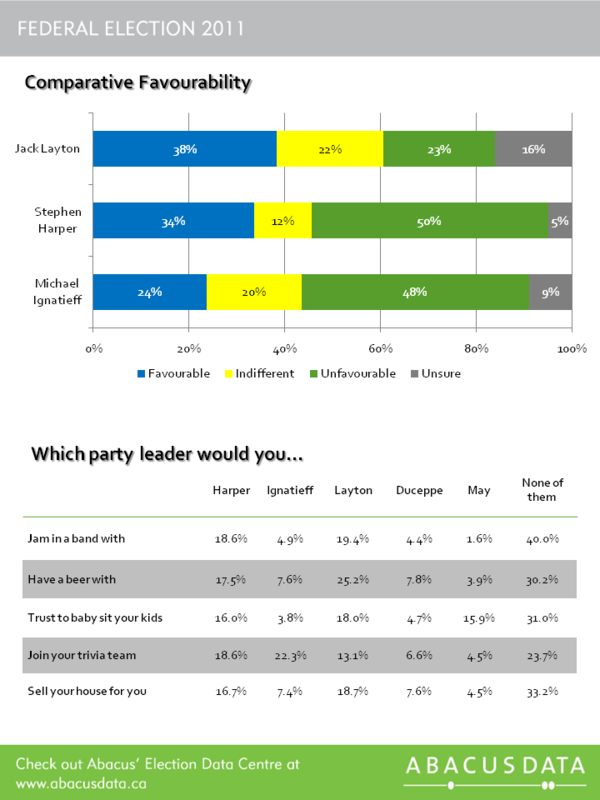 The Abacus Data survey asked Canadians whether they had a favourable or unfavourable impression of the three main party leaders. Overall, Jack Layton was viewed favourably by 38% of Canadians surveyed and unfavourably by 25% of respondents. Stephen Harper and Michael Ignatieff were far more polarizing figures. A majority of Canadians surveyed (52%) said they had an unfavourable impression of Mr. Harper with one in three (32%) saying they had a favourable impression. Mr. Ignatieff did not fare any better, with only 23% of respondents saying they had a favourable impression and 49% saying their impressions were not favourable. Among their own party supporters, the leaders are well regarded. Eighty-eight percent of Conservatives supporters have a favourable impression of Mr. Harper, 67% of Liberal supporters have a favourable impression of Mr. Ignatieff, and 69% of NDP supporters have a favourable rating of Jack Layton. Abacus Data also asked Canadians to rate their impressions of a number of high-profile celebrities and personalities. The party leaders faired well against the likes of Donald Trump, Tiger Woods, Charlie Sheen, and George W. Bush trailed significantly behind U.S. President Barack Obama, hockey star Sidney Crosby, and Rick Mercer, host of CBC’s the Rick Mercer Report. Between March 24 and 28, 2011, Abacus Data Inc. conducted an online survey among 1,000 randomly selected Canadian adults from an online panel of over 100,000 Canadians. The margin of error—which measures sampling variability—is comparable to +/- 3.2%, 19 times out of 20. Results of the survey were statistically weighted by gender, age, region, immigrant status, and language using census data from Statistics Canada and by past vote using Elections Canada results from the 2008 General Election. Totals may not add up to 100 due to rounding.